By the time Cre8tiveYouTH*ink decided to rent a studio space in Industry City for the Art School Without Walls Vol. 6., most of the project’s logistics were taken care of, except for one: feeding the entire crew each weekend as they worked on the mural. As luck would have it, there was a relatively new, small store named Ninja Bubble Tea, on the first floor of the building, which offers vietnamese sandwiches and a variety of beverages. Ninja Bubble Tea is co-owned by Soomee Suh and Chantha Uy. They met years ago in a business program at Borough of Manhattan Community College. Suh and Uy became pediatric nurses in the following years but the dream of entrepreneurship stayed with them. Last year, they both attended Bubble Tea University and jumped on the opportunity to open up shop in Sunset Park. They both still work full-time shifts as nurses, while taking turns running the store on the side. It’s been busy but satisfying work for the pair. They love the creative environment at Industry City, which they often participate in themselves. 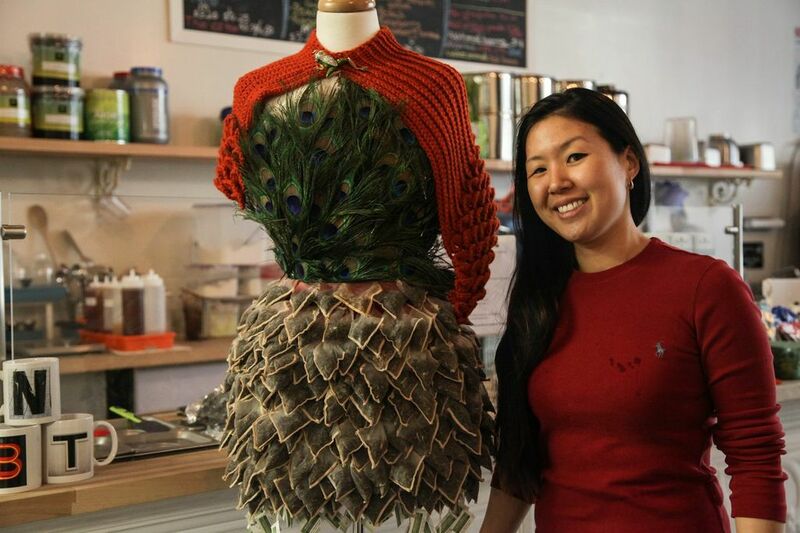 Whether by designing tea-inspired gear for Industry City’s Fashion Week, offering crochet lessons in their space during off-hours or exhibiting work by local artists on their walls, Suh and Uy are kindred spirits with the artists who patronize their store. Due to their love of the arts and their dedication to the local community, they worked out a special deal with Cre8tiveYouTH*ink to fill a very special order. Soomee Suh (right) and Chantha Uy designed this outfit for Industry City’s Fashion Week. 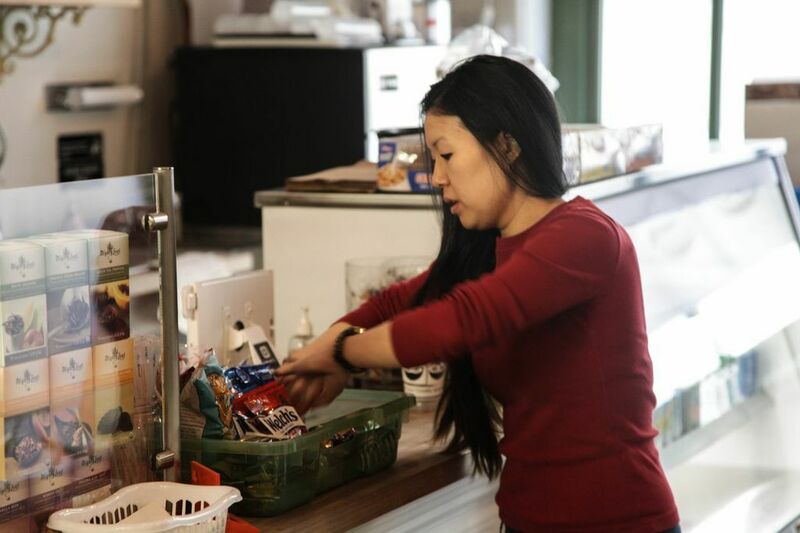 Soomee Suh, who runs the store each weekend, took the time to speak with us in between serving the many customers who constantly frequent their store. Can you tell us what inspired you to start Ninja Bubble Tea? Helping people is something Chantha and I are both passionate about and we wanted something of our own. I’m also an avid tea drinker and a big believer in anti-oxidants. I suffered from acid reflux, so I can’t enjoy coffee. Tea has been my salvation. I believe drinking tea is a wonderful life practice. We started to experiment with the sandwiches later. We came to Industry City last March and opened the business in September. We were with the old owners before Industry City merged. It used to be desolate in the front, just boxes. We were the first pioneers, establishing the first place to eat, to make it like a food court. It is nice to see the transition, from nothing to a place that’s more developed. We settled our home here because we love it here. What captured us was when we went upstairs and saw the artists. They manufacture, they sew, they paint, they do photography and graphic design. It’s such an artistic hub and we wanted to grow with it. It takes a lot of patience, hard work, and research, but there are a lot of people who will help you out for free. We got help from Score and from the Small Business Administration (SBA). It took a little time for us to launch the business, so keep your eye on the prize. Don’t be afraid. Once you take the first leap, you will be surprised at the outcome. Just go for it. Have you seen the Martha Cooper image being used for the mural? Oh yes, it’s beautiful. It reminds me of what New York used to be. I love that retro feel. It’s giving back what it once was to what it is now. And getting to watch these artists transform an image into a large mural is astounding. I’m so proud of all the young artists. It’s so full of life–each piece. I cant wait to see it on the building! What would you like to say to the artists? I would like to say it was such a pleasure getting to know everyone. I didn’t see this as a business opportunity as much as a chance to be included in this experience. It was a nurturing activity for me: making sure everyone was fed. I’m motherly like that. I’m gonna miss seeing their faces, watching them work so hard upstairs, and goofing off and chatting during breaks. I’m going to miss it all. What would you like to see next in Industry City? I would love more events like Fashion Week. We try to be included in all the fashion shows. The exhibit “Come Together: Surviving Sandy” was also amazing. We stayed open late for that. People were dedicated, coming to see the galleries during the cold season. Our buildings here were affected by Hurricane Sandy and some of the foundations were destroyed so that meant a lot to us. I’d love to see this place grow but still cater to the artists who work here. I love to see Mom-and-Pops shops so I watch out for them. We’re trying to emulate Chelsea Market but rooted on a more local scale–more humble, more art-and-community based. The artists still need to be able to practice their craft upstairs. What’s your favorite tea in the shop that you’d recommend? A green tea-passion blend called Mighty Tea. It’s light on the caffeine and has a beautiful melody of fruits blended with green tea.